Last night I was looking for something I could eat in quantity. 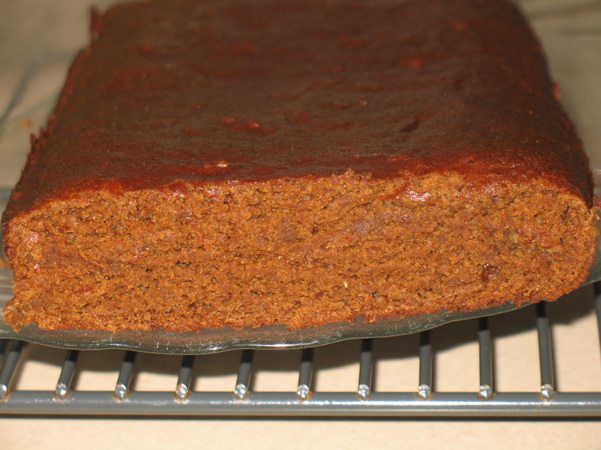 I knew I’d be on a post-Homeland food rampage so I made something that wouldn’t break the Weight Watchers Points Plus bank if I ate a large amount of it, and that’s how I found this recipe for pumpkin gingerbread. I also figured it wouldn’t be a favorite with anyone else, based on the low sugar content, and there are lots of other things here for the kids & Dave to eat, so I went for it. 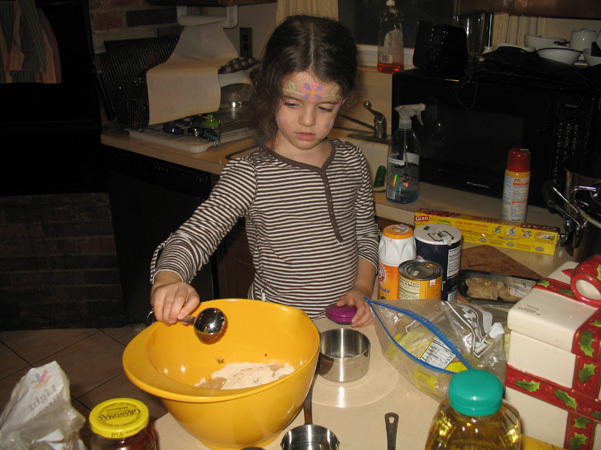 Juliet even offered to help, for a while, and since this was a one bowl recipe, I readily accepted. 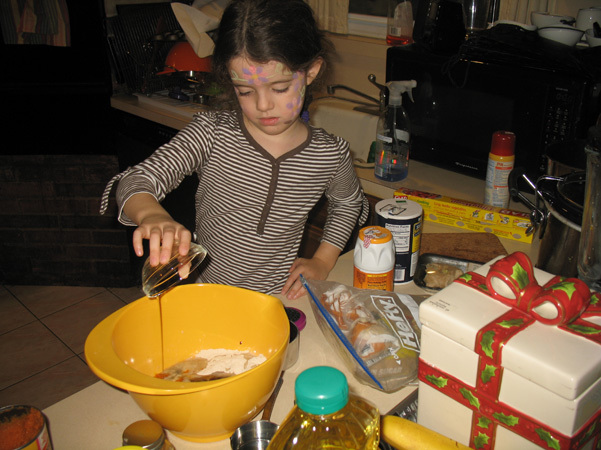 She’s always fun to bake with, even when she’s dropping eggs and spilling flour everywhere. We threw all the ingredients into one big yellow bowl. Juliet measured the flour. 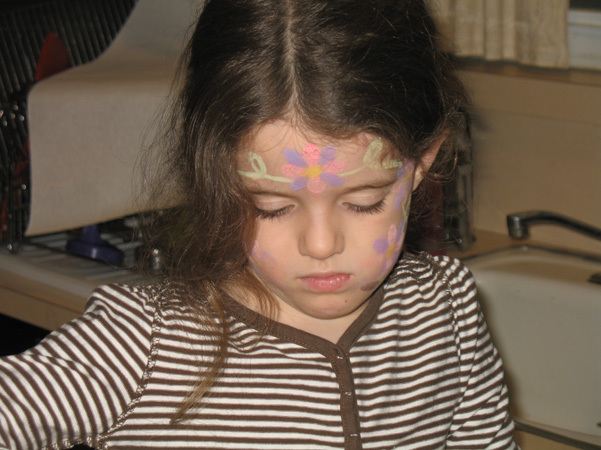 She’d just come back from a princess-themed birthday party, so she still had her face painted. 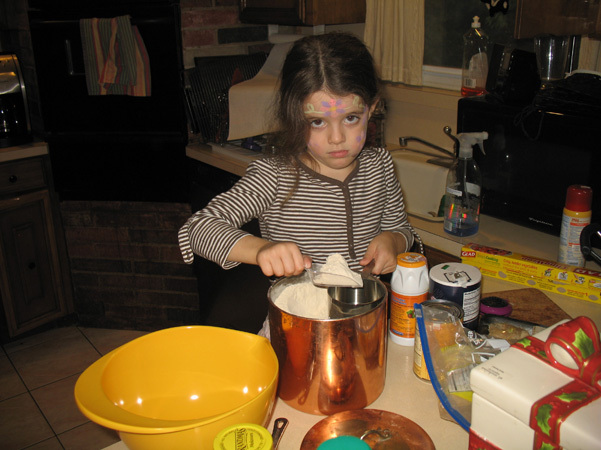 As you can see, measuring flour is serious business. I took the precaution of adding the molasses myself. 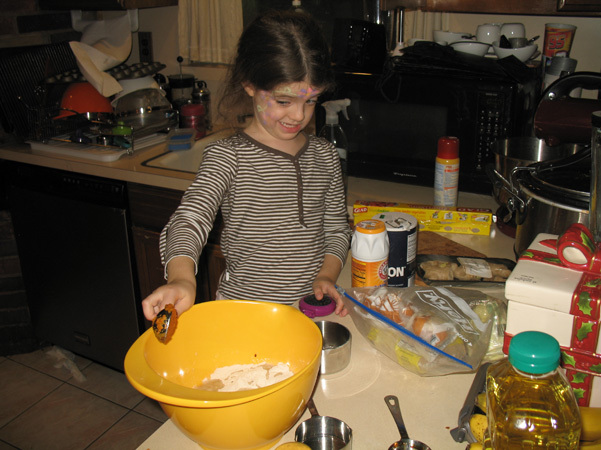 The recipe only called for two tablespoons of brown sugar, so I did the measuring but let Juliet dump them into the bowl. Then it came time for the three tablespoons of pumpkin. Juliet did not enjoy the smell. In fact, the third one was really pushing it for her, and she missed the bowl entirely. I separated an egg, and handed her the bowl with the egg white in it. 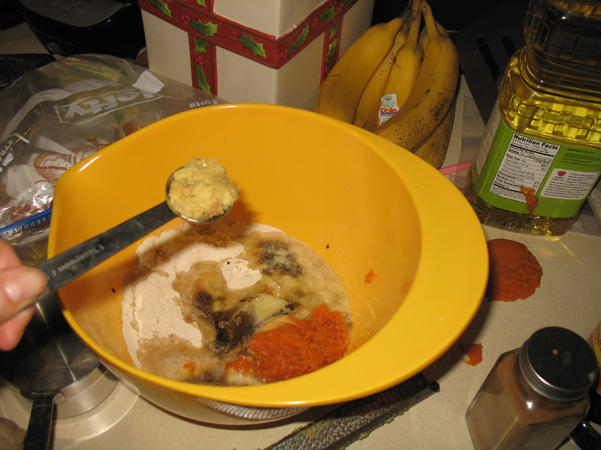 Then I took out a big piece of ginger root and started grating it. It was my first time using fresh ginger in a recipe! Juliet got bored and wandered off to play with Nathaniel. I added the grated ginger. 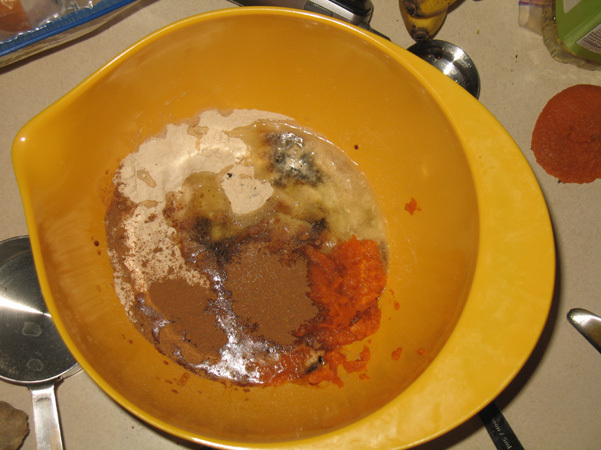 Then I finished it off with pumpkin pie spice (a lot more than suggested) and a dash of salt. I don’t really know what a “dash” is, or how it’s different from a pinch, and I didn’t Google it. I just winged it. So here is everything, in its one bowl. And then I just forgot to take pictures. 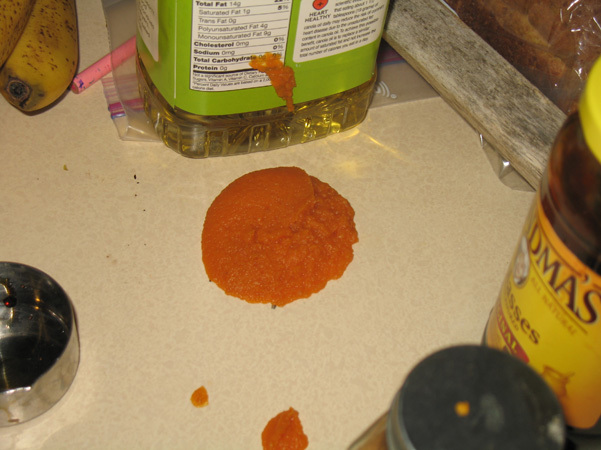 I stirred it up, and poured it into the pan, and put it in the oven, and then it was too late. D’oh. It said to bake from 30-35 minutes and at about 28 I checked it and it was definitely done. D’oh again. I think it was a bit overdone. But it smelled great. I knew it would be short, sort of a half-sized loaf, so that part didn’t surprise me. Once it had cooled, I cut it open. The verdict: it’s all right. You can tell it’s a low fat dessert, which is not really what I’m going for when I bake low-fat, healthier versions of things. I like it better when you can’t tell. Some more sugar would help. For that matter, so would a pint of ice cream. It did serve my purpose, though. I came back from yoga, we watched Homeland, and I ate a huge piece of it. 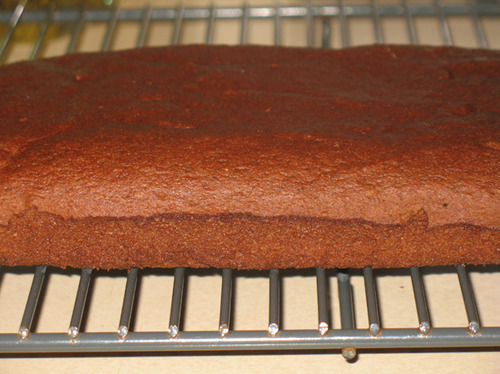 The spices are very nice, the crumb would be just right if I had taken it out of the oven a little sooner, but it did the job. Still, it’s not on my list to make again. Then again, it might be worth playing with, since the basics are there. I haven’t decided. 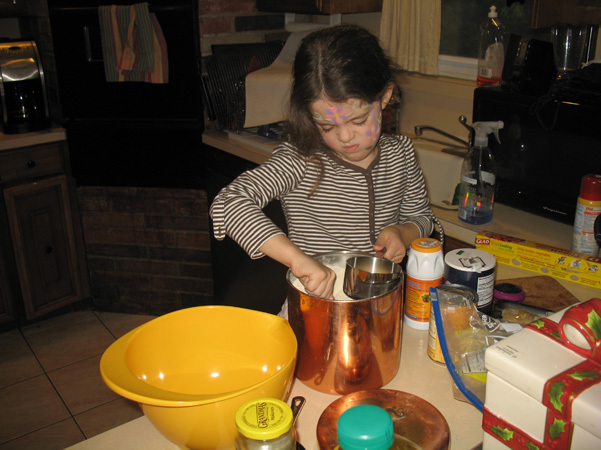 In the meantime, I’ll whip up a batch of those delicious gingerbread muffins tonight, to make up for it. 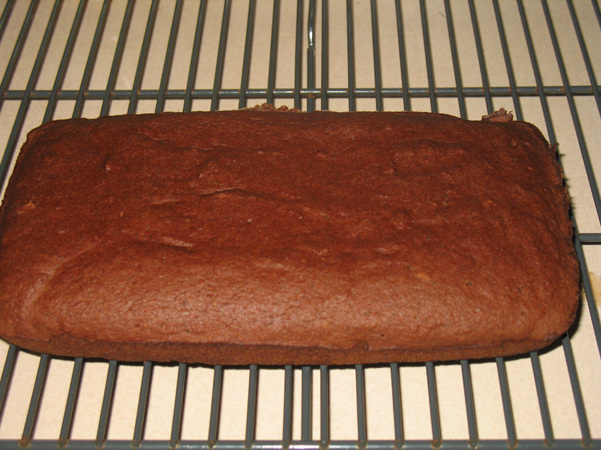 I’m still craving gingerbread and those are amazing.